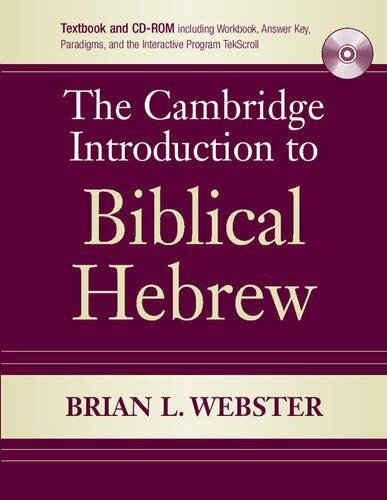 The Cambridge Introduction to Biblical Hebrew is designed for anyone studying biblical Hebrew for the first time. It is well suited for students enrolled in introductory-level courses as well as clergy and laity engaged in self-study. The accompanying CD (suitable for Mac and PC) includes the workbook, answers, paradigms, and the interactive program TekScroll. TekScroll greatly facilitates learning through grammar illustrations with moving graphics, interactive parsing programs, translation practice items, and a vocabulary program. The grammar illustrations demonstrate key grammatical points. The parsing programs provide feedback, hints, and corrections. Translation practice comes primarily from biblical verses. The vocabulary quizzing program includes audio of the vocabulary words. The textbook is designed for a two-semester course covering one chapter of grammar per week (22 chapters) and then turning to select syntactical items. Each chapter begins with a Focus section, identifying key elements, and is followed by a summary, vocabulary list, and description of the learning activities on the CD. The practice translation items and workbook exercises only use vocabulary from previous chapters (with few exceptions), so that they can be used immediately in classroom instruction.